June 14, 2011 – Louisiana has some quality Linebackers in the 2012 class, and if you follow recruiting, a name to add to the list for DI football is Henry Taylor of Scotlandville High School in Baton Rouge, Louisiana. Henry is everything you want in an outside linebacker. He’s fast (4.55/40), he’s a big time hitter, he reads and reacts to the ball every play, and he’s the perfect size at 6-0 foot tall and 210 pounds. Henry is one of the best hitters I saw all year long in 2011 in person and on film. His closing speed is a sight to see in person. What really impresses me while watching this kid in pass coverage or playing the run is he will run to the ball and attack and deliver big time hits in the open field. You can tell while watching him play that he loves the game and is not scared of anything. Henry reminds me of another former Scotlandville player, Herman Lathers, who was also 6-0, 210 pounds in high school, and now is 6-0, 230 at the University of Tennessee, where he starts and is Tennessee’s returning leading tackler. I think Henry runs even better and reads even better than Herman at this stage in High School. Henry Taylor bench presses a strong 305 pounds, squats 500 pounds, and power cleans 285. Those are some impressive stats for a kid only 210 pounds. He carries a 3.2 GPA in the classroom and has an ACT score of 18. This kid has a bright future, and look for a bunch of colleges to enter the mix before it’s all said and done before signing day this year. 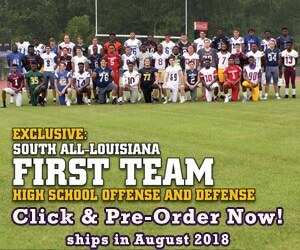 I will have more on Henry Taylor and the Scotlandville football team in our 2011 Louisiana Football Magazine Preview Issue which you can pre-order right now at www.lafootballmagazine.com/store.